Situated on 2 ridges with a steep slope, mostly pasture, some tightly wooded, with water hazards and daunting length. 100-year old barn serves as clubhouse. Private:$5/fee (honor system). Tony's cell: (703) 863-7243. Rte. 70 south to Rte. 522 south to Berkeley Springs, right on Rte. 9 west, 7.8 miles to a right on Detour Rd., 6.6 miles, right at end, 1 mile to a right at flying disc on tree (Gaither), 1.2 miles to barn on right. 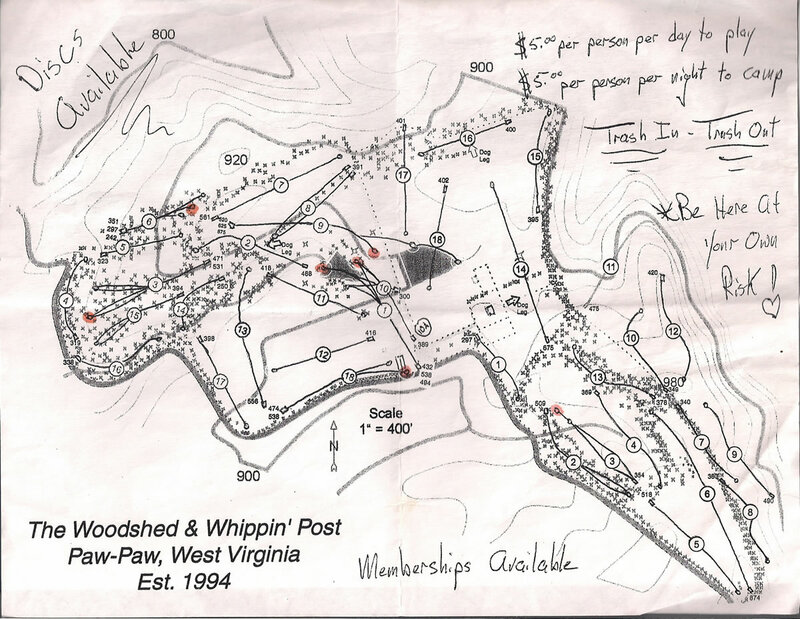 There are more polished courses, to be sure, but the highlight of the year is when my friends and I make our annual trek to the two side-by-side courses at Paw Paw, WV. From a technical standpoint these courses, with holes that are long, short, up hill, down hill, narrow, over water, and, in some cases, with barely discernable fairways, demand everything you've got as a player. Just to walk the two courses in a day would be tiring for us (office workers, all). To play them both is exhausting...but oh, so satisfying.